My friend comic magician Greg Moreland invited me to perform for the Portland Magic Jam convention he organizes each year. It’s a blast seeing old magic friends and hanging around with some big names in magic (Whit Hayden, Daryl, Doc Eason, Wayne Houchin, and more). The event is held at the Portlander Inn where they bring in a portable stage and pipe and drape to transform a mall-like area into space for the magic lectures and shows. See photos and videos from the 2014 Portland Magic Jam and the 2016 Portland Magic Jam. Contact me, Jeff Evans, if you’re looking for clean comedy and interactive magic for your private party or corporate event in the greater Portland area. Performances are available in two flavors: Strolling Magic and my Amazement Magic Show. Strolling Magic is close-up magic where I travel from group-to-group entertaining. It’s almost as though each person gets their own show! There is a lot of interaction, including magic that happens in the hands of your guests. Strolling magic is ideal for the cocktail hour as people are socializing and mingling. 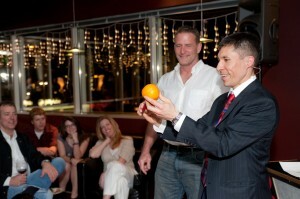 My Amazement Magic Show is very interactive so your associates and attendees are part of the experience. You’ll be happy to know that my show is always in good taste with clean comedy. Read client reviews here. Watch video highlights from a company party. Availability is limited; call me in Olympia toll-free (877) 412-5064 or send e-mail to jeff[at]amazementproductions.com to learn more about making your event fun and unforgettable. This entry was posted in Uncategorized and tagged Jeff Evans, magic, magician, Portland, Portland Magic Jam, Portland magician, Vancouver WA. Bookmark the permalink.